Initiated in 1989 and dedicated to media art, the WRO Biennial is one of the cultural consequences of the fall of the Berlin Wall. A strong French representation may be noticed this year due to the fact that Klio Krajewska, associated curator of the event, lives and works between Paris and Wroclaw in Poland. Bertrand Planes and Arnauld Colcomb are among the French artists to exhibit in the building of the future university library in Wroclaw, currently awaiting books and readers. Their sound installation "modulator-demodulator" has real physicality. But it is in the invisible space between the two essential components of the work, a transmitter and a receiver that it all happens. 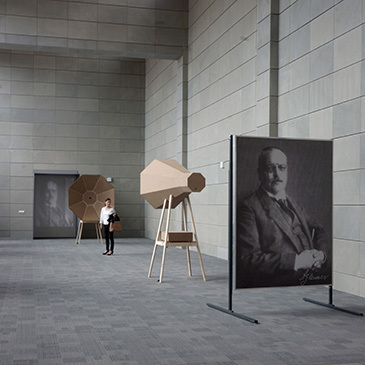 There where audio information transmitting the image of the portrait of Alois Alzheimer, who one learns died in Breslau, which later became Wroclaw, is irretrievably lost. What a strange match in this place that is to become a library, when we know that reading helps reduce risks of diseases causing memory loss. Though imposing and perfectly finished, the work of the two artists is however truly fragile since the slightest of sounds is likely to alter the memory of the machine, which somehow manages to transcribe the psychiatric doctor's portrait in endless sound variations. Cécile Babiole and Jean-Marie Boyer are also among the artists the French Institute accompanied to Wroclaw, whose installation entitled "Stream of conversation" again involves correspondence. It is a kind of correspondence wherein the number of characters is limited, as with Twitter, but which is part of the slowness of time needed for successive conversions of the same characters - ASCII code to Morse code - which packets of coloured water carry between two input positions. This brings to mind the prescient thought Paul Valéry wrote in 1929: "Just as water, gas, and electricity are brought into our houses from far off to satisfy our needs in response to a minimal effort, so we shall be supplied with visual or auditory images, which will appear and disappear at a simple movement of the hand, hardly more than a sign." This was long before the Internet was taken over by water companies who deluge us today with texts, images and sounds. Cécile Beau and Nicolas Montgermont, another French duo, began their piece by building the antenna that allows them to capture the wave textures inhabiting the silences of our everyday environments. With "Radiography", they make perceptible what usually is not, through images as well as through sound. It is therefore impossible to separate the waves that come from the depths of space from those emitted by our mobile phones. All of us live in a maelstrom of waves of the most diverse frequencies and which the artists show us the extreme granularity. Listening, in the scan of images that stretch to infinity, one begins to imagine celestial bodies, going as far as surrendering to this music of waves, in order to think of nothing else than the textures of a medium that possibly has no message whatsoever. Abstraction prevails over narration even though the temptation to gamble with interpretations is great. It is in this in between, in this non-determination, that the work is truly revealed. Olga Kisseleva is of Russian origin but lives and works mainly in Paris. The public in the Ile-de-France know the piece that she presented in Wroclaw, as it was recently shown at the Art Centre of Enghien-les-Bains. "Power Struggle", originally designed as a performance, portrays the confrontation between four anti-viruses. The speed at which the code is deployed in the projected video image punctuates the clashes between programmes whose colours reflect the acquisition or loss of territories. Each anti-virus thinks the other applications are nothing but malware. All strategies are implemented to move the lines in this region that has seen its borders shifting, oscillating between Germany and Poland. 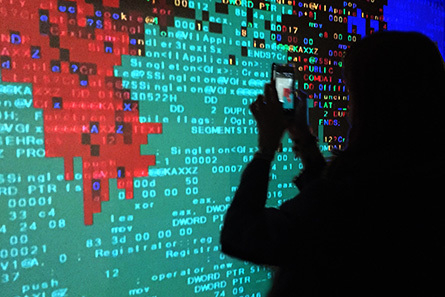 In view of the determined confidence of the anti-virus, we may think of the powers that authorise border movements at the whim of a signature, thus writing the history that people always end up correcting. Because in the end, we want to continue to believe it is not, in the image of this machine temporarily affected by a glut, an irreversible situation. 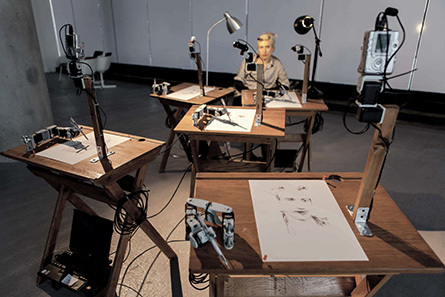 Patrick Tresset, another French artist who lives in London, came with his five robot drawing machines. They are part of the historical continuity of the Jaquet-Droz drawing automaton dating from the second half of the eighteenth century, but with one significant difference as it is "on the fly" they draw live models whose empathy for robots is quite astounding. Everyone plays the game by accepting the rule of holding the pose for several minutes. Here the artist is like a professor, depositing sheets of paper he collects later before hanging the portraits that gradually line the walls of the exhibition. Robots are beginning to multiply around us but they are usually assigned tasks, chores or "robota" in Slavic. 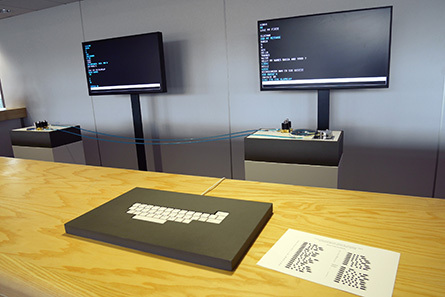 Meanwhile, it is artists like Patrick Tresset who encourage us to establish other kinds of relationships with these machines that are increasingly populating our daily environments. And then there is a sound of such absolute richness, but which can be summarised in a single note, or almost, that seems to stretch all the way to us as though it were to guide us to the artist Kasper T. Toeplitz who, day after day, tirelessly performs. 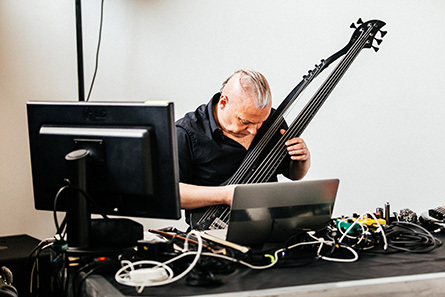 A chair in the room where he plays a bass guitar augmented by some electronic components is turned away to one side rather than facing the audience. As we sat there, gazing this way and that, we were carried away by a multitude of sonic textures that come together over time to become only one. This immersion having neither beginning nor end, it is up to the viewers to extract themselves, without the sound ever truly disappearing. It is in the Polski Theatre that most of the performances are given by artists like Joachim Montessuis. With "Vocal Codes", which ranges from his whispering through to a full-throated scream, he performs alone in front of the public whom he later invites to come on to the stage to give a second performance entitled "Le vray remède d’amour” (The true remedy for love). 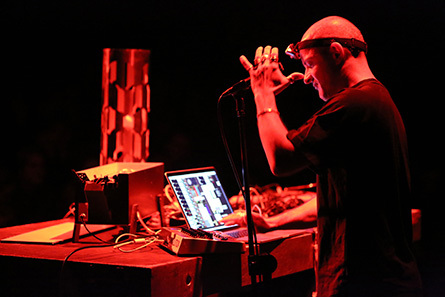 The luminous atmosphere is punctuated by rotations of dreamachines arranged among the audience while the sound of an electronic drone rotates in its sounding board as it circulates in the room. The experience is very much collective and its intensity is felt by the endless silence that follows. Finally, there are some works scattered about the city, even in the above ground parking lot of the Renoma Department Store. 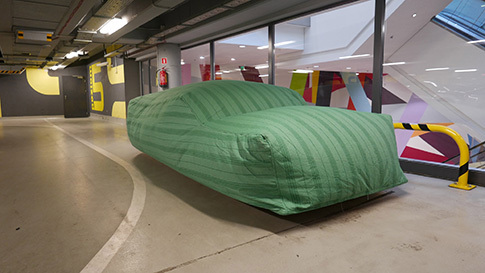 Vincent Voillat has placed "car dreams" there with a piece entitled "Rolling Carpets". It is with pulsed air that he sculpts the three volumes shaped by car covers with patterns and colours of Cairo. 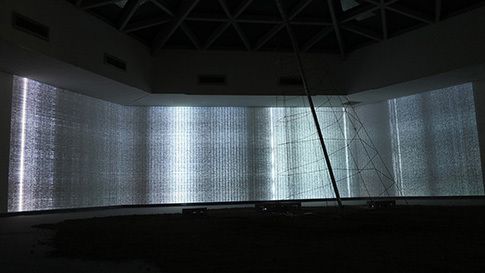 The artist has also caught the sound environment in Egypt that contextualises its installation. But what do these sham cars from elsewhere say to us, from so far and yet so near, and whose fragility the audience verifies by touching them? Unless it is that Europe, to continue its development, must inevitably strengthen its cooperation with the countries of the southern Mediterranean ! Written by Dominique Moulon for Art Press and translated by Geoffrey Finch, May 2015.